I always assumed that Koreans wore masks for one of two reasons: to block air pollution or to prevent the spread (from or to themselves) of disease. Masks come in different materials, thicknesses, and sizes, but I just thought the choice was dependent on personal preference and fit. Ajummas (old ladies), for example, love giant masks, in combination with huge visors, which cover their entire faces, because they're crazy, and they do what they want. According to my co-teacher, who wears masks all the time, different masks serve different purposes. She has one that she says "keeps her wet." (I know, I chuckled too.) She wears it to moisten her throat at night or when it's sore. It's made of thick cotton. She has another, more industrial-looking mask, to protect from dust and some air pollution. It can be molded to her face to prevent air gaps. It also matches yellow bracelets. Regretfully, she forgot her large, two-piece mask today. We have a teachers' field trip planned, to visit a nearby mountain for an afternoon hike. She would have worn it, had she remembered to bring it. 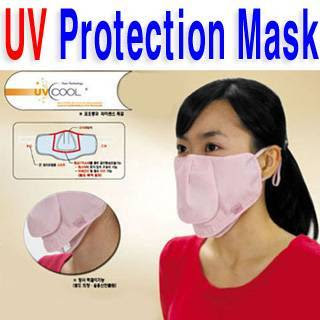 It's a UV mask, to protect from sunburn. It is also great at elephant costume parties. ur teacher seems as if she's showcasing her bra..
Hsiu-I has masks made from very elaborate fabris (with gold sparkles!) that she wore when she rode her scooter in Taiwan. Your co-teachers masks are pretty plain jane! @dokebi: haha how many teachers have you seen showing off their bras...? @becky: i haven't seen too many elaborate face masks here, the wildest they get is neon colors. but the visors that the ajummas wear can get pretty outrageous, with glitter and sparkles and whatnot. i'll try to get some pics to post soon. Refreshing. I bought one and never wore it.